Remove BIO-FILM from the water and system using Bio-Klenz. Bio-Klenz is a fast-acting BIO-CLEANER especially developed for the “hot water” environments of Spa Pools and Hot Tubs to remove BIO-FILM from pipework, fi lters and spa surfaces. Used MONTHLY, it will protect your Spa Pool or Hot Tub all year round. It will keep your water in the freshest, cleanest and highest quality condition that you’ve ever experienced. Bio-Klenz should reduce your overall maintenance chemical costs and increase the clarity and brilliance of your water. It also enhances your fi lter’s ability to fi lter fi ner particulates and contaminants. Bio-Klenz should reduce your overall maintenance chemical costs and increase the clarity and brilliance of your water. It also enhances your fi lter’s ability to fi lter fi ner particulates and contaminants. By using Bio-Klenz regularly each MONTH you will. Enjoy clearer water which feels both soft and silky. Have better looking and fresher smelling water. Find heater element(s) will stay cleaner. 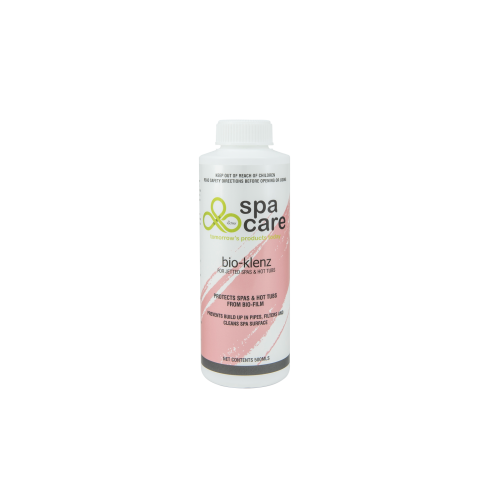 Spa Care™ Bio-Klenz should be added in accordance with the directions given.